A San Pedro father was gunned down at a bar on San Pedro. Last night around 10:30, 21 year old Julian Trapp was hanging out with his brother and fiancé at La Choza Bar when a brazen gunman fired at them. This was not the first time the family has been targeted. Courtney Weatherburne has more details. Every Friday morning Julian Trapp would bring his 10 year old niece Deanna to Manelly's ice cream shop - an outing she always looked forward to. Today, her mother had to take her instead, but for little Deanna, it wasn't the same and it never will be. Julian Trapp was shot and killed last night at La Choza Bar and Grill - his favorite chill spot. Trapp, his fiancée, and his brother Armando Trapp along with another friend were hanging out inside the bar when a gunman walked up to them and opened fire. "My brother told me he saw what happened, he say he saw someone coming from behind him because Julian Trapp had his back against you know." 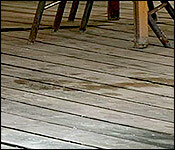 "He saw someone coming and point a gun and he scream and told Julian gunman when he hollered gunman, the gunman burst two shot and one of them caught Armando's hand, then the bartender scream and say run and everybody run and when Julian notice that his girlfriend was left behind he went back and look for his girl and that is when he got shot." Amateur video shows the aftermath when police rushed Julian's limp, bloodied body to the hospital, but he didn't make it. According to the family, he was shot about 7 times. Today, Trapp's only sister and his niece re-visited the scene. As they stared at the spot where Julian was ruthlessly gunned down, they tried to piece together what could have led to his murder. Jeidi says it is a family feud that got out of hand when Armando was shot in April. Julian was just caught in the middle. "It is a long time beef, nothing to do with Julian but you know with our families, other families but like they say if you can't get who they want get, they will get whoever is around and that is what happened because Julian is not that type of person, he is 21 years old and he is one of the top mechanics on San Pedro, he has been working 9 years at J and H and not even the police can say it is drug related because they never caught or charged Julian for no drugs or nothing." "Do you know how or when this beef started?" "I am not sure because I was living in the city, like the first time my brother got shot, Armando." "That was this year April right?" "Yes ma'am that was when the beef started all over." Now that bad blood has left a family broken with only good memories to hold on to. His friends and relatives say Julian wasn't a saint but he sure had good qualities. "And you guys were close, tell us about that relationship, how close were you guys?" "We hang out, we drink, we party, we laugh you know and give trouble, but good trouble (LAUGH)." "Well actually, he as a nice person, always sharing, loving likes to party." "I am sure he will certainly be missed." "Yes he is missed by everyone." 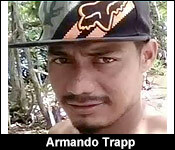 Armando Trapp was treated and released. The family says Armando saw the shooter's face and knows who he is. But in the police report it states that the gunman had a mask. Julian Trapp leaves behind a 2 year old son. He had just started his own golf cart business earlier this year. He would have gotten married in December. 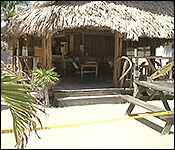 On Thursday last week, two brothers were shot on Ambergris Caye. 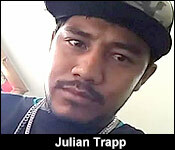 , 21-year-old Julian Trapp was killed at La Choza Bar in San Pedro Town but his brother survived. Assistant Superintendent of Police, Alejandro Cowo says that the surviving brother has been unable to identify the person who shot them. Police believe it the murder was gang-related since Trapp’s funeral was attended by a gang member.